These days, our dogs are important members of the family so it stands to reason that not only do we want to ensure their health, comfort, well being and safety but we also want them to look mighty fine while we’re at it. From traffic-light warning system, colour-coded harnesses and leads (red for stop! Leave me alone; orange for proceed with caution; and green for ‘hey, I’m friendly, stroke me!) to designer shabby-chic sets or favourite sports team styled combos, there has never been so much choice. But here’s a thought: what about if the best dog collars, leads and harnesses could help keep our dogs safe while also looking good? Just how cool would that be? However, I’ve had a little root around on the net, and it’s clear to see that things are starting to move in the right direction. Indeed, there are quite a few innovations, where safe and comfortable equipment for your furry family is becoming rather smart at last! Some of the best harnesses out there, for example, are not only waterproof (I tried keeping my dogs out of the water once. I succeeded for, oh, ten seconds?) but often slightly padded and some even have EVA moulding that forms to your dog’s shape, making rubbing and chafing a thing of the past. Better still, some can even be adapted for use as restraints in the car, with seat belt attachments. You can also find rather funky looking flotation vests and even rashies, complete with 50+ UV protection. Even the most stylish of dog collars around must still be highly durable, strong and sturdy, with robust D-rings that won’t compromise the fastenings – imagine if the collar flew open and your beloved canine companion bounded into a busy road. It’s every dog owner’s worst nightmare and yet 1.2 million dogs are killed on the roads every year. EVERY SINGLE YEAR. Of that 1.2 million, most of those poor furbabies are killed at night, so how about something for added visibility – much more than just reflective or fluorescent – something that could actually save a dog’s life? 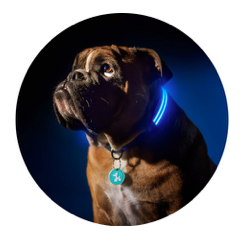 Some bright spark – pun absolutely intended – recently came up with LED light collars that are also incredibly cool. There are just so many super stylish colours and also matching leads with the same innovative technology. I mean, we all know about the importance of lights on cars and bikes, don’t we? And some companies produce flashing lights to attach to dogs’ harnesses but LED light collars take it to the next level because a lead and collar are actually basic equipment, aren’t they? It just makes sense. 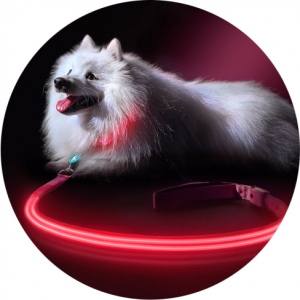 The brightest and one of the best dog collars EVER is also probably the most innovative EVER – the Poochlight LED collar, because THIS one (as well as the obvious style credentials with some seriously cool colours) is USB rechargeable, so no frustrating and potentially dangerous low battery issues. You get to win ‘find the dog’ on dark fields more often, too. Please don’t leave your dog’s safety and comfort to chance. You’d never forgive yourself if the worst happened, and there’s really no excuse with so many stylish options around.